Glass cremation pendants are a great way to honor your pet and keep them close to your heart. Solstice Glass creates hand blown glass cremation memorials using your loved one’s ashes. The ashes are encased in hot molten glass and sealed inside a memorial pendant, forever capturing their energy in a beautiful piece of cremation jewelry. Company Story – Mark Hamilton has been a professional lampwork glass artist for 15+ years. In 1996 on a trip to Asheville, North Carolina a lampwork bead artist showed him how to make a few soft glass beads on her torch. He was hooked! Not long after that, during a visit to Aukland, one of New Zealand’s foremost glass artists Peter Viesnik spent an afternoon teaching him to make glass beads in his studio. 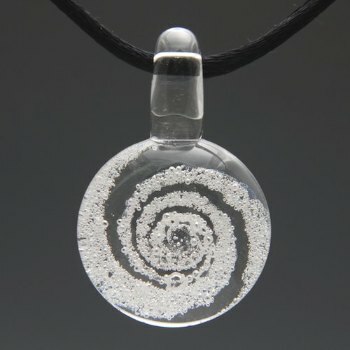 The result, these beautiful glass cremation pendants. Product Story – When you commission your cremation jewelry, Mark promises to treat the ashes of your loved one with the same care and respect he would have for his own. Along with the ashes, he requests a photo that you feel really captures their essential nature along with any personal stories you would like to share. With this information, he will create a special custom piece of cremation jewelry for you and anyone else who wishes to remember them.